The Lower Mekong and its tributaries occupy 20 percent of the landmass in Laos. As a result of immense water resources and international financial backing, Laos is undergoing a period of rapid hydropower development. There are 11 new dams proposed on the main Mekong tributary, and the Nam Theun 2 Dam, the largest in Laos, was completed in 2009. Most of the 1070 megawatts of power the Nam Theun 2 generates is exported to Thailand. In addition to generating hydropower, the Mekong is the largest inland fishery in the world, and contains over 1200 individual fish species, rivaled in biodiversity only by the Amazon. Despite the abundance of fish, the World Food Program estimates that two out of three Laotians are food insecure or at risk for becoming food insecure. Dam construction threatens to block or alter the paths of the 87 percent of fish that migrate, and therefore limit access to the primary protein source for most Laotians. This project was completed in the winter of 2011, and aims to answer how the construction of the Nam Theun 2 Dam, as a single piece of infrastructure and a case study of a larger condition, has acted as a spatial organizer to rework urban, ecological, and hydrological landscapes in central Laos. The Lower Mekong River flows through Laos, Thailand, Cambodia, and empties into the South China Sea in Vietnam. It is one of the most diverse global river ecosystems, with over 1200 species of fish that provide the majority of food protein for 60 million people living in the Lower Mekong basin. The river is the lifeline of these countries, food, drinking water, transport, and irrigation, as well as cultural and social practices, depends on the Mekong (Wong 38). There are currently four mainstream dams on the river, with an additionally 30 planned on the mainstream and tributaries. In 2009, the largest hydropower project in Southeast Asia was completed in Laos, the Nam Theun 2 Dam, on the Nam Theun, a Mekong tributary. In recent years, Laos has marketed itself as the “battery of Southeast Asia” due to its immense water resources and is welcoming private international companies interested in dam construction (Lawrence 5). The combination of water resources and a poor domestic population allows Laos to exports a majority of power to Thailand and Vietnam. The process of hydropower development in Laos presents a series of ecological, social, and economic contradictions. The recent building of dams in Laos threatens fish ecosystems, which the majority of the population relies on as a food source, and fails to provide domestic infrastructure that could bring electricity to rural areas of the country. Therefore, this project proposes to answer, how has dam construction in Laos, particularly the recent Nam Theun 2, altered preexisting hydrologic conditions, and what are the agricultural and aquaculture implications of hydrologic shifts? How can the practice of landscape architecture think about creating food secure areas in some of the poorest regions in the world? Can this be balanced with expanding infrastructure development? The objective of this project is to begin to understand dam development in Laos through an agricultural and hydrological perspective, and gain a better understanding of what might be a balance of national infrastructure development with traditional local needs. Laos is a landlocked country of almost 6 million in Southeast Asia with a GDP of 4 billion per year. It is bordered by China, Thailand, Cambodia, and Vietnam, and much of the country falls into the Mekong watershed. The river forms the border with Thailand and tributaries flow through much of the country, covering 20 percent of the land. The majority of the land cover is tropical forest, and only 0.8 percent of the country sits outside of the floodplain (Revenga 92). Lacking roads in many rural areas, the Mekong is the infrastructural backbone of the country, in addition to the nutritional and cultural centerpiece. Southeast Asia is the world’s largest hydropower region, containing more then half of all large dams. Laos’ emphiashum toward large dams fueled the construction of the Nam Theun 2 dam in central Laos, the first World Bank backed major dam since the mid-1990’s, and six other dams are currently under construction (Mydans 1). Laos contributes 35 percent of Mekong flows and has an estimated 18,000 MW of power potential (Lawrence 15). In 2007, Thailand and Laos signed an agreement for Laos to supply Thailand with 7,000 MW of electricity, and Laos and Vietnam have reached agreements for 5,000 MW to be developed for Vietnam (Lawrence 19). 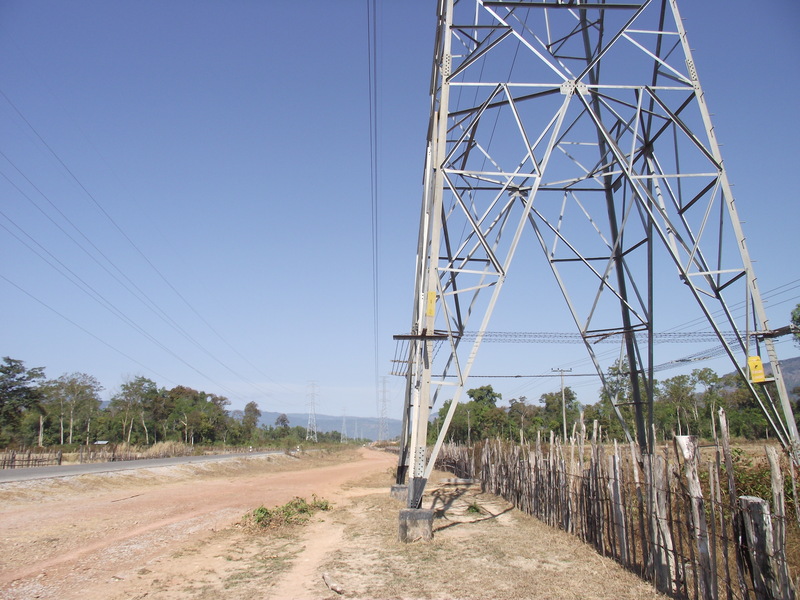 Considering that Laos has 18,000 MW of potential power, this leaves 6,000 MW for internal use. Hydropower development in Laos exploded in the 1990’s but the fall of Asian markets in 1997 caused many international development companies to leave the area. The Nam Theun 2 Power Company remained, supported by a French company, Electricité de France. The World Bank and Asian Development Bank contributed 270 million dollars and 107 million dollars respectively, to the 1.4 billion dollar project that begin construction in 2005. The 45-meter high dam and 450 square kilometer reservoir was completed in 2009, displaced 6,200 hundred people during construction, and changes to the river’s flow have effected an estimated 120,000 people (Lawrence 43). Currently it is the largest dam in Laos, generating1,070 MW of power, most of which is exported to Thailand. Dams radically and permanently change native floodplains. The Nam Theun 2 dam has a 450 square kilometer reservoir and rechanneling continues for 27 kilometers downstream. Flooding to form reservoirs contributes to loss of agricultural land, significant in a country with only four to five percent arable land, and 40 percent of the GDP based in subsistence agriculture, providing 80 percent of overall employment (Wong 38). Understanding access to fish migrations and agricultural land are two key factors for increasing food security for communities in Laos. There needs to be ecosystem management that maintains an ecological balance of the river system, emphasizes links between critical habitats and migration corridors, and understands the role of hydrologic patterns in the creation of annual floodplains (Lee 25). The most irrevocable effects on fisheries and fish migration are the development of infrastructure that permanently alter rivers annual flows. The project was completed over three weeks in the winter of 2011 by traveling through central Laos in motorbike. Central to the research was five days spent traveling in the area immediately surrounding the Nam Thuen 2, the reservoir, and power station. Along this route I met with people who had worked on the dam and been relocated by the dam. The recent construction of the dam is obvious: the channelized portion of the Nam Thuen downriver from the dam is shocking in the rigidness of its form, and the flooded area upstream of the dam is even more visually confrontational, as 30 miles of road are bordered by now flooded to semi-flooded rainforest. North of the dam, in the area now flooded by the reservoir, the new roads built for dam access are littered with settlement villages, newly constructed for relocated peoples. While these homes offer more amenities then what existed before, such as electricity, they lack a long-term viable way for communities to generate income. Prior to the dam, agriculture was the main economic generator, but as viable land is now flooded, the communities need to transition to alternative economies. In post-dam planning, this type of long term thinking about alternative income generation was missing. It seems that slowly people are transitioning to more water based economies because the reservoir is so massive. The most common type of commercial trade and economy I witnessed was the sale of charcoal, which had little long-term benefit for these communities. To summarize one interviewee who worked on the dam and continues to live in the region, the dam provided jobs and was good for the people during the five years of construction, but once construction was complete, they left no future for the surrounding communities. Most surprising was the extent to which the dam had affected the surrounding landscape on a regional level. Since the completion of the dam three years ago, the region has been reconfigured in terms of roads, settlements, electrical right-of-ways, and supporting infrastructure. Therefore, the major conclusion of the visit was the extent to which a dam, as a single, albeit, massive piece of infrastructure, works as a spatial organizer. New roads are built where dam construction occurs, and roads stop where the dam stop. Towns are relocated to be within proximity to these new roads. Electrical right of ways cross remote areas. Perhaps more then any other type of spatial organizer, dams question the extent of urbanism beyond the city. Often located in remote, unpopulated, or rural areas, dams allow for or affect the growth of cities hundreds or even thousands of miles away. In this sense, dams become a type of organization space with the construction of one piece of infrastructure; roads, electric plants, and people follow. Asian Development Bank. Asian Development Outlook 2008. Asian Development Bank: Philippines, 2008. Lawrence, Shannon. Power Surge: The Impacts of Rapid Dam Development in Laos. International Rivers: Berkeley. 2008. Lee, Gary and Natalia Scurrah. Power and Responsibility: The Mekong River Commission and Lower Mekong mainstream dams. Oxfam Australia and University of Sydney: Sydney, 2009. Mydans, Seth. “A Massive Dam, Under Way in Laos, Generates Worries”. New York Times 26 June 2006, 4 October 2010. http://www.nytimes.com/2006/06/26/world/asia/26laos. Peterson, Brooke and Carl Middleton. Feeding Southeast Asia: Mekong River Fisheries and Regional Food Security. International Rivers, 2010. Revenga, Carmen, et al. Watersheds of the World: Ecological Value and Vulnerability. World Resources Institute, 1998.